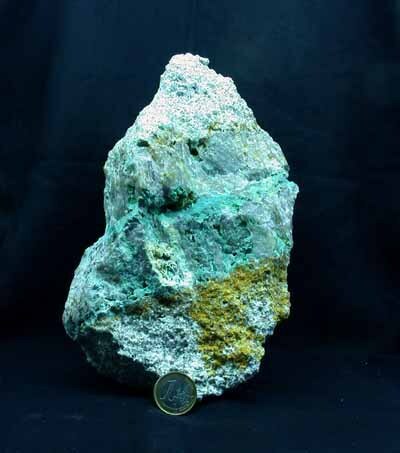 Rashleighite: Mineral information, data and localities. Turquoise Group. 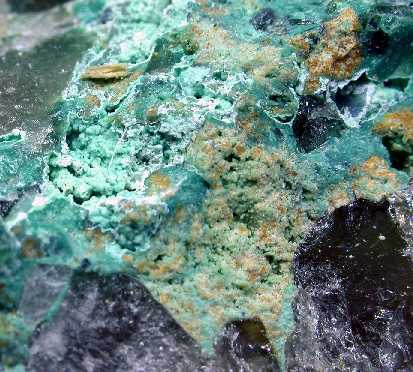 A ferrian Turquoise variety, intermediate on the Chalcosiderite-Turquoise Series. Originally reported from Bunny Mine (Bonny Mine; St Austell Hills Mine; Shelton Mine), Bugle, Hensbarrow Downs, Luxulyan Area (Luxulian Area), St Austell District, Cornwall, England, UK and Castle-an-Dinas Mine, St Columb Major, Belowda Area, St Austell District, Cornwall, England, UK. Libethenite 7 photos of Rashleighite associated with Libethenite on mindat.org. Quartz 7 photos of Rashleighite associated with Quartz on mindat.org. Opal 5 photos of Rashleighite associated with Opal on mindat.org. Wavellite 5 photos of Rashleighite associated with Wavellite on mindat.org. Cacoxenite 3 photos of Rashleighite associated with Cacoxenite on mindat.org. 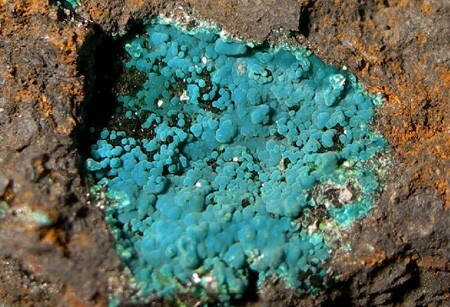 Turquoise 2 photos of Rashleighite associated with Turquoise on mindat.org. Limonite 1 photo of Rashleighite associated with Limonite on mindat.org. Zapatalite 1 photo of Rashleighite associated with Zapatalite on mindat.org. Goethite 1 photo of Rashleighite associated with Goethite on mindat.org. Pseudomalachite 1 photo of Rashleighite associated with Pseudomalachite on mindat.org. Fairbanks (1942) The Mineralogist, Portland, Oregon: 10: 44 (as ferri-turquois). Russell (1948) Mineralogical Magazine: 28: 353. Palache, C., Berman, H., & Frondel, C. (1951), The System of Mineralogy of James Dwight Dana and Edward Salisbury Dana, Yale University 1837-1892, Volume II. John Wiley and Sons, Inc., New York, 7th edition, revised and enlarged, 1124 pp. : 947. Palache, C., Berman, H., & Frondel, C. (1951), The System of Mineralogy of James Dwight Dana and Edward Salisbury Dana, Yale University 1837-1892, Volume II. John Wiley and Sons, Inc., New York, 7th edition, revised and enlarged, 1124 pp. : 951. Rudler, F.W. (1905): A Handbook to a Collection of the Minerals of the British Islands, Mostly Selected from the Ludlam Collection. HMSO Publications (London), 241 pp.